Panic is in the air. You can see it in the way the S&P 500 has plunged in a big one-day drop below its 200-day moving average -- just as it did before the 1929 and 1987 market crashes. Or in the way the CBOE Volatility Index, a measure of Wall Street's fear, jumped above its 50-day average -- a level associated with significant pullbacks. Or in the way the interest rate on 10-year Treasury notes (1.47%) has dropped to its lowest level ever as investors seek safety in the arms of Uncle Sam -- pushing inflation-adjusted yields deeper into negative territory. The previous record (1.55%) was hit after Thanksgiving 1945. If people are willing to pay the government for the privilege of investing in T-bonds, you know things are bad. But really, how much downside risk is there for stocks? Let's take a look. In my last post, I surveyed the economics of our predicament. And they weren't good. Now, from a purely technical perspective, thinks look even worse. 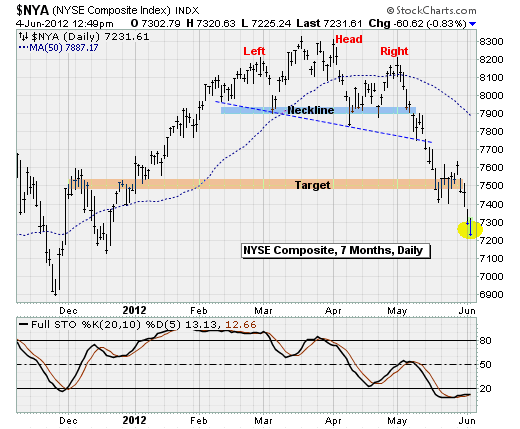 The NYSE Composite has three separate but connected head-and-shoulders reversal patterns in play. They are reflections of the phases of greed, denial and fear that accompany major market tops. The daily chart, shown above, has already seen the pattern fully played out. Formed between February and May, the reversal pattern suggested a target of around 7,500 on the index, a level that acted as a support range late last month. But now we've fallen through that level, putting the November and December lows in play. Backing out, the weekly head-and-shoulders reversal pattern that has been forming since the panic over the first Greek bailout back in 2010 is now in play. If the neckline support at around 7,000 fails, which is only a 3% drop from current levels, the new target would be around 5,300. That would be worth a 27% drop from here. 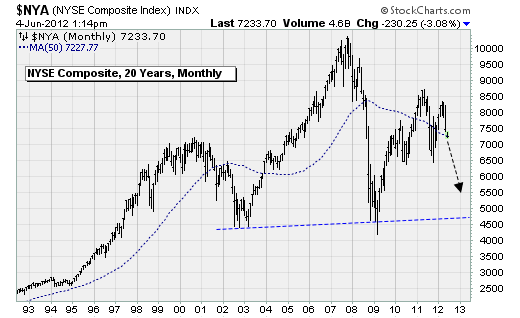 Backing out even more, an epic monthly head-and-shoulders reversal is in play, too, starting when the dot-com bubble burst back in 2000. 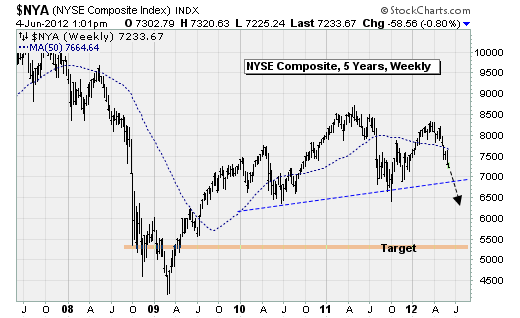 The shoulders of the pattern aren't perfectly symmetrical, but the 2002-03 and 2009 bear market lows are eerily close. That's the neckline support. And if it's broken, the pattern suggests a price target of minus 1,000 based on the distance from the neckline to the head, which is that 2007 bull market high. Well, let's just call it zero. Technical analysis is more art than science. There are no hard-and-fast rules, only tendencies. So take this with a grain of salt. But it is worth noting that other long-term indicators -- such as trading volume, fund flow data and cumulative breadth measures -- paint a similarly dark picture. It won't be a straight shot there. As I discussed Friday, I expect both the Federal Reserve and the European Central Bank, unbounded by falling energy prices and a global growth outlook that's deteriorating quickly, to inject fresh monetary stimulus into the financial markets later this month. That, combined with some type shift by the Germans away from their hardline stance against deeper eurozone integration (via sovereign liability sharing and/or a euro-wide bank deposit insurance scheme) should set off a short-cover rebound rally. While economics suggest the bounce won't last long, the technicals paint a grim picture of what lies beyond. Selling pressure is currently focusing on the financial sector, and one industry group within it is just now starting to fall out of its February-May topping pattern: regional banks. There are a plethora of attractive short candidates in the area. I am adding two to my Edge Letter Sample Portfolio: Regions Financial (RF) and Fulton Financial (FULT). Existing precious-metal positions continue to perform well, with Great Basin Gold (GBG) a standout worth highlighting. Disclosure: Anthony has recommended RF short to his newsletter subscribers.